Exclusive illustrations to colour in carefully selected from the British Library's archive. Before the invention of the printing press, books were written out by hand, and were priceless objects. The most precious books were illuminated with pictures highlighted with gold or with bright colours. Real and imaginary animals populated the pages of medieval books, particularly encyclopedias. 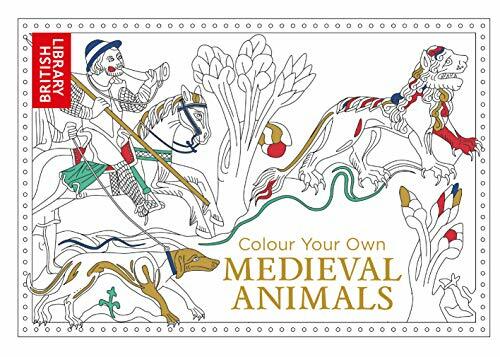 This new colouring book is packed with familiar and exotic creatures carefully selected from the extensive collection of the British Library. The animal illustrations have been sourced from a range of documents, including charters and seals and historical and literary manuscripts, from Homer to the Codex Sinaiticus, from Beowulf to Chaucer, and from Magna Carta to the papers of Henry VIII and Elizabeth I. Each of the original drawings is reproduced in colour, so that you can decide whether you prefer to choose your own colours, or to use the colours that the artist intended. With key facts about each of the animals and their source, this is the perfect book for animal lovers, history buffs and colouring-in fanatics alike. The British Library is the largest library in the world. The collection includes over 150 million items in many languages, including manuscripts and historical items dating back as far as 2000BC.